Top Notch Material: $50 to Pacific Play Tents! 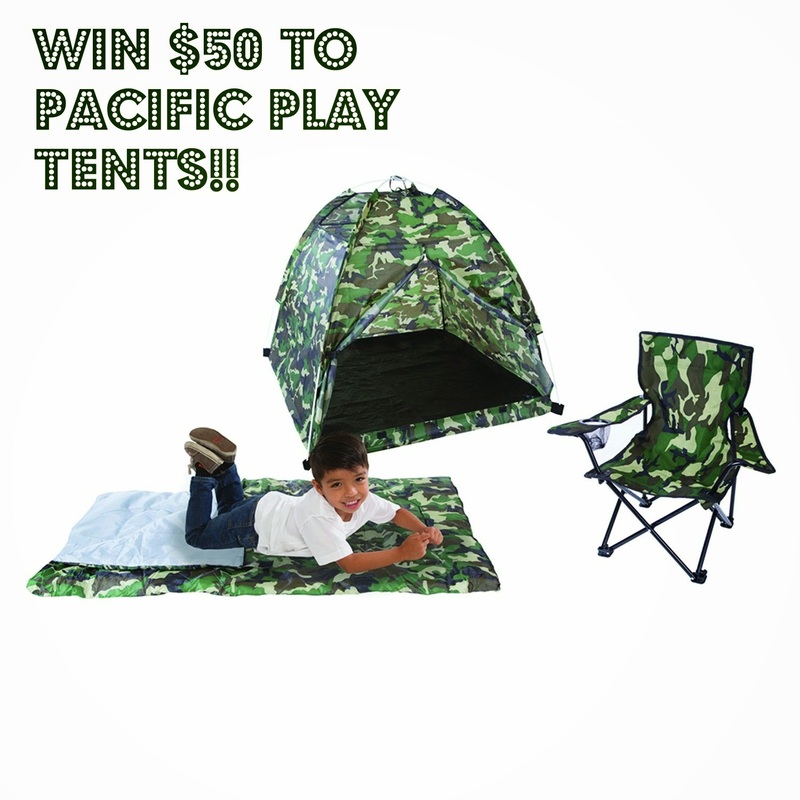 $50 to Pacific Play Tents! My boys love using their imagination so when I was asked to review an item from Pacific Play Tents I jumped at the chance.We received the green camo set from them which included the tent, the chair and a sleeping bag. Both of my boys really enjoyed this set and even got daddy and our dog involved too! Since receiving this set, we have spent a ton of time in it, and even had pick nick lunches and even pretended to roast marshmallows! It is just big enough to fit both of my boys (ages 2 and 7) in it but not overwhelmingly big (which is great since it is kept in my living room!) The chair is actually extremely sturdy and great to take along with you to the beach or anywhere else that your little one might like a chair to sit in, and the sleeping bag is just as comfortable as every other sleeping bag I have ever been in, and a pretty good size! It would definitely hold my almost 80lb 7 year old well. I find it very important that kids use their imagination sometimes and "unplug" from electronics, and Pacific Play Tents allow just that. It encourages kids to use their imagination, which is something that is missing from many kids lives today. Not only does Pacific Play tents offer this awesome 3-piece tent collection, but also more "girly" themed items, baby tents, tunnels, parachutes and chairs! Lots of wonderful items are available online, and at affordable prices. Win It: Pacific Play Tents did not want to limit your selection of the PERFECT play tent for your little one, so they are offering $50 for you to choose which item is awesome for your family. Probably the cottage house..so many cool things!!! I would probably use the $50 towards the Kings Kingdom Combo. I would get the Starburst Lil Nursery Tent! It is sooo cute & could be for a girl or boy. There is alot of different & cute things on this site, very cool!! Cottage Bed Tent looks like fun. I really like the "My Tent 48 Inch X 48 Inch X 42 Inch" (Item: 20205). I like the Baby Suite Deluxe Lil Nursery Tent 36 Inch X 36 Inch X 36 Inch - Pink. So many choices! I'd choose either a baby one-touch tent or the Peek-A-Boo I See You 6 Foot Connecting Tunnel. I would use this gift code towards the Painting Teepee. I would put the $50 towards the My 1st Garage Play House. I would get the small cottage play tent. Visited and I love the dinosaur train railway staiton tent. I would get the Dancing Fairies Castle for my daughter. I entered Lugz Regiment Lo Shoes Giveaway. I think my niece would love the Baby Suite Deluxe Lil Nursery Tent 36 Inch X 36 Inch X 36 Inch - Pink! I would probably get the baby suite deluxe nursery in the green. I like the my little tent and the cottage bed tent. I would get a My Little Tent. These are so cute. I might choose the My Little Tent 48 Inch X 48 Inch X 42 Inch or the cute little racer car sleeper tent. I would put the gift certificate towards one of their beach cabana tents for my kids this summer! I like the ocean adventures dome tent. I'd get the Come Fly With Me tent. I would choose the Playchute Parachute - 10 Foot- Rainbow. I would just choose the I See You 6 Foot x 22 Inch Tunnel. I like the Ladybug Tent & Tunnel Combination so I'd probably use it on that for my girls. I would chose the Cottage Bed Tent. My daughter would love it!